The goal of Research Institute for Business and Social Processes of the Faculty of Economics and Management is to conduct research in the field of social sciences and related cross-disciplinary scientific fields in Latvia, Europe and global context, as well as to provide scientific and practical support to Rezekne Academy of Technologies and particularly to study fields of the Faculty of Economics and business. analysis of information and communication processes (history, social memory, and mass media). 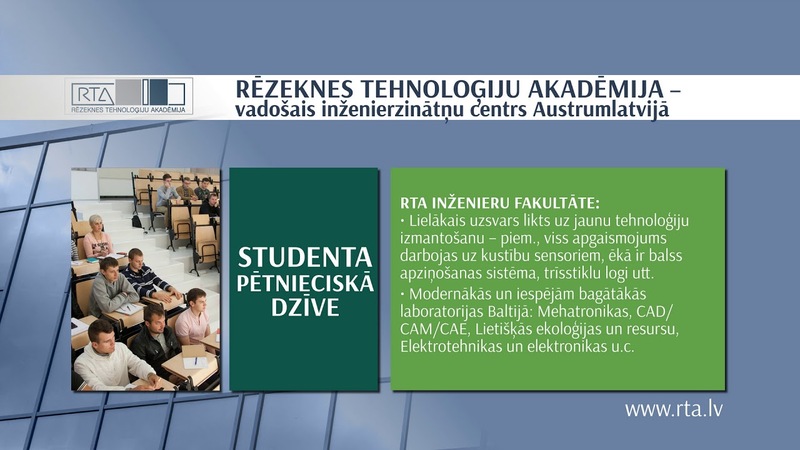 RTA project “Research Grant of Rezekne Academy of Technologies” Possibilities for the Use of Green Procurement in Food Public Procurement for Rezekne Municipality Institutions (project manager- A.Zvaigzne, duration- 2017). RTA project “Research Grant of Rezekne Academy of Technologies” Conservation and Restoration of Cultural and Natural Heritage of Riebiņi Municipality (project manager- L.Litavniece, duration- 2017). RTA project “Research Grant of Rezekne Academy of Technologies” Quality Audit of Tourism Products Offered in Rezekne Region (project manager- L.Litavniece, duration- 2017). Preparation of a communication plan (media research, monitoring, development of advertising and brand).